The Snapdragon has been one of the most preferred processors for almost all the prominent smartphone manufacturers. They are continually developing the newer versions of its processors to cater to the ever-growing demands of the smartphone consumers and the manufacturers from entry-level to flagships. For 2019, Qualcomm has planned two modern successors to its line-up of acclaimed processors. The Qualcomm Snapdragon 845 vs 855 are the two excellent processors coming up quite soon and will power the new flagships. How do these two new age processors compare with each other? Let us check out in detail in the following paragraphs. Of course, it is just the name of the processor that we have at present. The processor that is set to power a few of the flagships of the year in 2018 was announced, but there were no indications about what it will come packed with and the specifications thereof. Even now, we do not have reliable information available about what it will come up with. However, you have access to a few details as of now. Let us find what it plans to come up with. A processor as we refer to it is not a monolithic processor. It is a chip (SoC) on which different processors are fabricated together as a package. The corrected term that one should use is the SoC or “System on Chip.” Qualcomm has been adding different processors on its SoCs over the years for enhancing both performance and functionality. Some examples are image signal processors and Digital signal processors that we have been observing in the previous versions of Snapdragon processors. The 845 will be the first processor to offer a dedicated SPU – Secure Processing Unit. This will help protect all your data, and that will include everything right from fingerprints, iris, mobile payments, SIM, and more. The SPU will be independent of other processors and systems thus making it stay safer from hacking attempts. Smartphones are equipped with HDR capability, but capturing the quality videos in 4K has so far been the prerogative of the professionals. However, the Snapdragon 845 improves its signal processing unit. It can now capture 4K videos in 60 fps without hiccups. This will help you get images and videos that are crisp clear with better contrast, details, and colors. The slow motion to receives a boost with slow motion shoots supported at 480 fps and 240 fps at 720p and 1080p. The AI is taking shape and is practically taking every aspect of our life into its fold, and smartphone processors need to focus on it. Snapdragon 845 realizes the need and improves the performance of machine learning with the aid of Hexagon 685 digital processor. It will be able to analyze and identify the objects as defined by your camera using cognitive services. The phones want to be future ready. Connectivity is the name of the game. So your new processor needs to acquire the skills. The new Snapdragon 845 gest the latest X20 LTE modem onboard. It will support speeds up to 1.2 Gbps. So, we have finally come to know about it – Samsung’s next flagship will come with the new Snapdragon processor. Yes, we are talking about Snapdragon 855. So, how does it compare with the predecessor the Snapdragon 845? Let us examine both Snapdragon 845 and 855 in today’s post and arrive at the best features that both these siblings bring about. Well, the Snapdragon 855 came with the advanced features and planned as the best successor to the Snapdragon 845. From that perspective, how about understanding the salient features that the Snapdragon 845 comes equipped with? First and foremost, the Snapdragon 845 comes with the Qualcomm Spectra 280 ISP. The component offers the best camera performance coupled with the new age XR capabilities. If you are looking for the ultra HD performance for your video shooting, the Snapdragon 845 is an excellent option. The processor also offers you the Adreno 630 graphics processor for your graphics requirements. The Snapdragon 845 also comes equipped with full support for the AI capabilities. You have access to the dedicated neural engine for your requirements. The 3rd generation Hexagon™ 685 DSP enhances the AI processing capabilities. Another advantage you will find interesting enough would be the inclusion of an X20 modem. The new LTE modem will provide you access to speeds equivalent to the fiber optic level performance. In essence, the Snapdragon 845 offers you several advantages like an excellent camera performance, enhanced biometrics, and AI implementation and a faster Gigabit experience. The Snapdragon 845 is a great performer concerning security. It is the first processor that comes equipped with the dedicated security measure – Secure processing unit. It will take care of all your security requirements right from fingerprints, mobile payments, and other elements. The Snapdragon 845 offers you recording 4K videos in 60 fps. Even the slow-motion receives a to 480 fps and 240 fps at 720p and 1080p. An excellent machine learning is another feature that makes the Snapdragon 845 a viable option. Snapdragon 855 – What does it promise? So, those were the excellent features on the Snapdragon 845. So, what changes does the Snapdragon 855 come with? Well, the Snapdragon 855 takes off from where Snapdragon 845 stops. Yes, the Snapdragon 855 will be using a 7nm manufacturing process, while the Snapdragon 845 is manufactured with the 10 nm manufacturing process. There are several insights about enhanced machine learning and AI capabilities. Likely to be available on the new flagship Samsung Galaxy S10, it is expected to come with a new LTE modem, the X24. If this happens, you can expect the download speeds in the range of 2Gbps. Even the performance and power efficiency are expected to take a boost. Leaks suggest that there will be an improvement of over 40 percent. The fingerprint sensors will have ultrasonic speeds. Of course, the technology is available to some extent on the existing processors and in the Snapdragon 845, but still, we expect the technology will come up with flying colors in the upcoming days. A tabular comparison can be quite helpful in understanding the differences between the Snapdragon 845 and 855. The processor is still under development, and there is not much information available. In any case, here is the information that can be helpful for a good idea. Well, these were a few features that would make a perfect comparison between the Snapdragon 845 and Snapdragon 855. From the details indicated above, it should be clear that the Snapdragon 855 is indeed an upgrade over the Snapdragon 855 and takes forward the feature sets on the 845 further. While making use of the excellent 4G connectivity, it also unleashes the 5G connectivity and its power. High-grade cinematography is yet another feature that makes it an attractive option for the next generation computer vision ISP performance. The processor is the first one in the world to offer HDR10+ functionality. 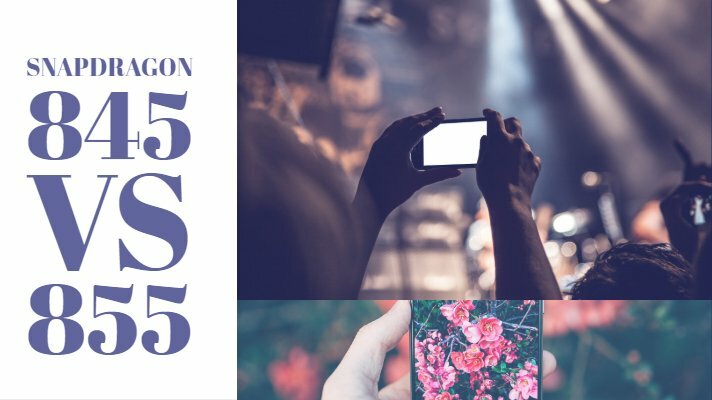 Snapdragon 855 – What Does it Come With? While Snapdragon 845 may be seen powering the Samsung’s latest flagship is the form of Galaxy S9 and S9+, Qualcomm is already developing the next generation of processors. Well, yes – we are talking about the Qualcomm Snapdragon 855. While Snapdragon 845 is set to be using the 10nm manufacturing process, Qualcomm is believed to be working on developing a 7 nm technology for the Snapdragon 855. It is supposed to have several improvements over the Snapdragon 845 if rumors come true. The speculations indicate the possibilities of enhanced machine learning and AI capabilities than those on the Snapdragon 845. The next processor will be offering you a 7nm chip. It is expected to be available on the Samsung Galaxy S10 which probably will be the first phone to feature it if everything goes as per the speculations. One of the additional changes we may find on the Snapdragon 855 as compared to the Snapdragon 845 is the use of anew LTE modem in the form of X24. The technology has been unveiled only recently. We would expect the new Snapdragon 855 chipset to offer the functionality. If it does, you can expect the download speeds of around 2Gbps. 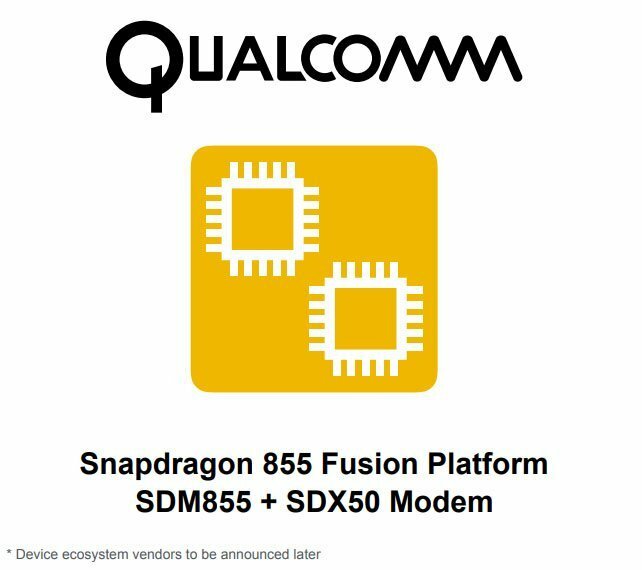 The technology may not be available on the Snapdragon 845 as yet as it has been rumored to come with X20 LTE modem. Leaks from Qualcomm indicate the options like around 40 percent hike in better performance and improved efficiency regarding power efficiency. The Snapdragon 855 devices are expected to bring in fingerprint scanners with ultrasonic speeds. Of course, the technology is already available on the Snapdragon 845, but we would expect the technology to go into becoming a usual tendency in 2019. Please note that the points we have included concerning the Snapdragon 855 are purely speculative as the Snapdragon 845 has not yet been launched. That was all we have for the comparison between Snapdragon 855 and 845. We assume that we have covered almost all the important aspects with respect to the differences between the two siblings. The Snapdragon 855 is looking promising and perhaps take the mobile technology to the next level when it is made available. The world’s first commercial 5G platform, it is bound to provide you the next generation WiFi standards coupled with a transformative 5G experience. Of course, the launch of Galaxy S10 and S10+ will offer us a useful input into how capable the processor is. There are perfect indications available for the upcoming Snapdragon 845 and its features. However, Qualcomm is still developing the SoC, and the final picture will only be apparent after the actual development and deployment of the processor. In such a scenario, it is even more challenging to find information on the new Snapdragon 855. So, we would wish to warn our readers that all while the information contained herein concerning the features on Snapdragon 845 would be almost possible, the information on Snapdragon 855 need to be taken with a pinch of salt. Before we conclude this discussion, let us make it clear once again that most of the updates about the Snapdragon 845 as presented here come with a possibility of seeing the light of the day, the same cannot be stated about the Snapdragon 855. Things about the latest iteration of the Snapdragon SoC will only be cleared after the Snapdragon 855 is announced and made available.